Takahashi et al. 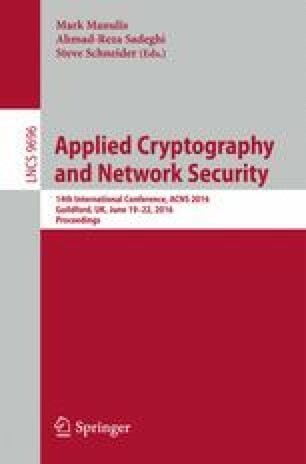 (ACNS 2015) introduced the notion of fuzzy signature, which is a signature scheme that allows a signature to be generated using “fuzzy data” (i.e. a noisy string such as a biometric feature) as a signing key, without using any additional user-specific data (such as a helper string in the context of fuzzy extractors). They gave a generic construction of a fuzzy signature scheme from the combination of an ordinary signature scheme with some homomorphic properties regarding keys and signatures, and a new primitive that they call linear sketch, and showed a concrete instantiation based on the Waters signature scheme (EUROCRYPT 2005). A major weakness of their scheme is that fuzzy data is assumed to be distributed uniformly, and another is that it has somewhat large public parameter (proportional to the security parameter), and requires bilinear groups, and either (or both) of these properties could be barriers for implementation and/or practical use. In this paper, we revisit the results of Takahashi et al. : We show that in their generic construction, the requirements on each of the building blocks can be relaxed in several aspects. More specifically, our relaxation for the underlying linear sketch scheme allows us to use a new linear sketch scheme (that we propose) for a fuzzy key setting different from that of Takahashi et al., for which we only require that the average min-entropy of fuzzy data is high (under the situation some part of its information is leaked). Furthermore, our relaxation on the underlying signature scheme enables us to now use the Schnorr signature scheme as a building block. Our concrete instantiation of a fuzzy signature scheme is, although relying on a random oracle, arguably much more practical than the scheme by Takahashi et al. The latter relaxation routes through a variant of related key security for signature schemes. The authors would like to thank the anonymous reviewers for their invaluable comments and suggestions.